How about munching on crunchy flavorful bites? Think about Horlicks and your mind cannot go beyond the Horlicks milkshake. But this was a few years back until Horlicks biscuits were introduced. 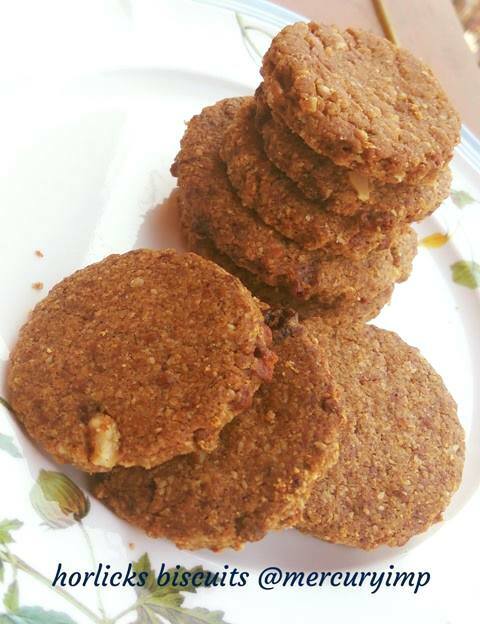 These crunchy cookies with Horlicks flavor became widely popular with tiny tots. Although I was not a toddler then, I fell for these flavorful bites too. Of course, you know me by now - I am a cookie lover. But then the health bug bit me and I started quitting anything and everything suspicious. Then was the turn of the baking monster, which got me into baking cookies every now and then to satiate my cookie cravings. This was the time my experiments with wholegrain baking began. Yes, I no longer need to travel to Patiala's Kwality Bakers to get my favorite biscuits, for I can bake everything at home. Happy me! Hey, but this is the first time I have tried Horlicks biscuits market like. My earlier attempt was different. It was Horlicks nankhatai at that time, though I had added Powervita to the cookie mix. But if you love Horlicks biscuits, then these power-packed cookies are a must try. Believe you me, this simple cookie recipe will take you by storm and draw you toward baking healthy biscuits at home. 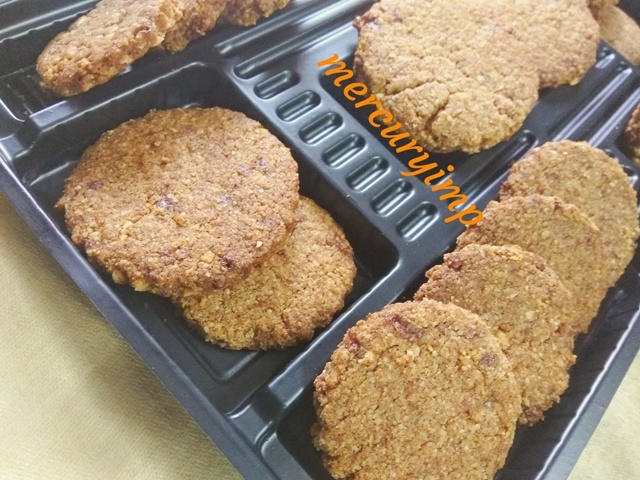 So what makes this batch of sugarfree Horlicks biscuits with oatmeal so special? 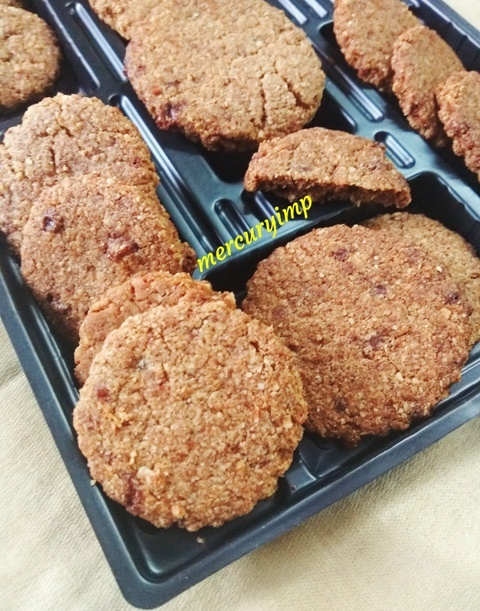 These are my most special biscuits - for I got the best compliment from dad, when he said "there is nothing better than these - nothing can compare with these delicious bites"
Now you might be wondering if baking with Horlicks is a challenge. Well, of course, not! My two recipes using Horlicks are cookie recipes. I have used airfryer for cookies on both occasions. You might choose to bake in microwave convection or oven. These cookies can be tried on stovetop as well. The options are galore. Whisk ghee, oil until well combined. Add jaggery powder and salt. Whisk again. Add milk and it's time to whisk for the final time until light and fluffy. This step is very important to baking crispy, crunchy cookies with Horlicks. Next, take a strainer and sift through the remaining dry ingredients. Start mixing everything with hands. Combine the ingredients into dough. DO NOT KNEAD. We are not adding any raising agent here, so kneading will result in gluten formation. Gluten gives chewy texture to cookies. Do you want your cookies to be chewy? Of course not! So why would you want to knead the dough here? We are not trying to make chapatis! Make a log and wrap in a cling film or aluminum foil or airtight container and refirgerate for 30minutes. After half an hour, preheat oven (mw convection) at 170degrees for 10 mins. I airfried the cookies, so preheat the airfryer for 3 mins. Take out the log from the refirgerator. Roll out into a thick roti using rolling pin. Cut into desired shapes. Bake/airfry for 8-10 mins at 170 degrees. Oven setting vary, so you may need a couple of minutes extra to bake these chocolaty beauties. Allow the eggless Horlicks biscuits to cool down before munching on crunchy bites. Do not try to touch the cookies when they are still hot, as they might crumble. The Horlicks cookies need time to tighten up and become crunchy. They will be ready in half an hour. So patience is advised. This is one of my favorite cookie batches now - packed with fiber, minerals, proteins, and energy bites! So when are you trying out this simple cookie recipe? It's time to surprise your tiny tots with a healthylicious cookie recipe that tastes divine and oh so chocolatty! 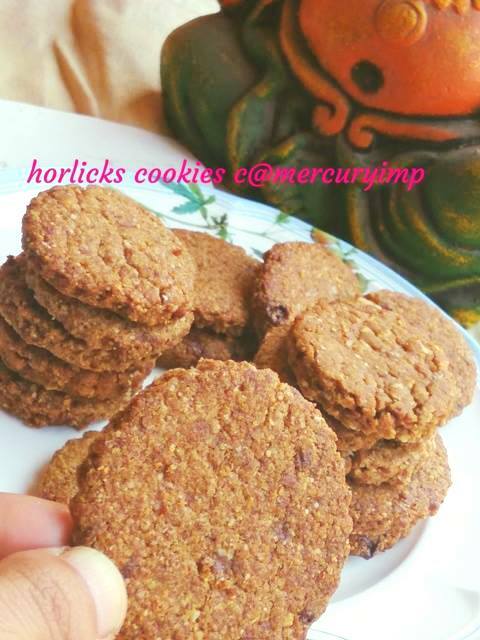 This horlicks cookie recipe is a must must try. Wow, look tasty! Can i cook this with my phillips air fryer at https://bestairfryer.reviews/philips-air-fryer/? I have it and it cook everything great!